What is a domain name? It’s the www.PLACE.com that you tell people to visit you at. In the online world your domain name is like your street address and your website hosting is your neighborhood. We’ll talk more about hosting services in another post. First, let’s get your domain name chosen and registered to you. I will say that I recommend purchasing your domains and hosting from separate places, even though most domain registrars will offer you a hosting package, so as not to keep all of your eggs in one basket as they say. Before we even get to the registrar where you’ll set up your registration, take some time to think about what you want the URL to be. It’s good to start with a few ideas in mind just in case your first choice isn’t available. Maybe you want something more like www.PurpleWidgets.com? Do you want a particular keyword in your domain name, something like www.BestTeaKettles.com? Make it something that you can say easily that can be remembered so it’s easy to convey in conversation (or during a podcast interview, webinar, etc). There’s also the decision of what domain extension you want. In most cases I would recommend getting the dot com, but there are a lot of interesting extensions available these days and sometimes they’re a good fit for a certain project. (These are referred to as TLDs top-level domains). In addtion to the .com, .org, .net, .biz, .info, .us, .co.uk, .co, .ca, .us, .de, and other location specfic extensions, there are also new TLDs that can be fun and totally different,…. Those are just a handful of examples, there are hundreds of URL extensions available. In the majority of cases you’ll just want to get the standard .com because that’s what people are familiar with and used to typing, but in the right context and for the right niche site project a fun domain extension could be a great choice to help you stand out from the crowd a bit. There’s some debate about whether these creative TLDs are more difficult to rank for search traffic, but not a lot of evidence for or against choosing them. Google has said they treat them all the same and they’re more concerned with finding good content on the page than they are with what comes after the dot in the browser bar. Avoid using numbers in your domain name. It’s confusing for people when they hear the domain rather than click on a link to it. If you absolutely do want a number in the domain for some reason (for example, the name of your product or business includes it) then I recommend purchasing both the numeric version and the spelled out version. As an example, you might buy 2BlueWidgets.com and TwoBlueWidgets.com. You can set one as the main site and simply redirect the other URL to the one you’re actually publishing on. Think before you hyphenate. Hyphenated domains are tempting when you’re trying to get a certain combination of words in the domain name, but people are going to forget about that hyphen when they’re typing rather than clicking. If you’re considering a hyphenated domain because the un-hyphenated version is already taken, consider also that people are absolutely going to visit the wrong site when they do a search and find both available in the results. Why give away your traffic like that? 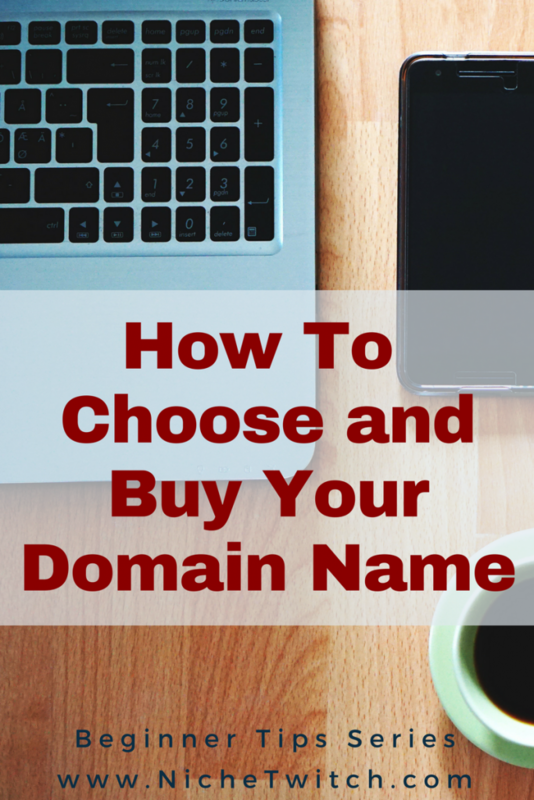 Pick a different domain name to avoid confusion long-term. Don’t use trademarks or other brand specific words in your domain name. I made this mistake once. I registered a domain name that included ‘Kindle’ as part of the URL. I almost lost my Amazon affiliate status because of it. If you’re creating a niche affiliate site to promote a specific product, don’t put that product name in your domain. Use a generic broad term or something else that relates to the niche overall. The coupon code entitles you to register or transfer your .com, .net, .org, .biz, .info at discounted rates and can be used up to 30 times per account. In terms of price your standard dot com domain name is going to be around $10. 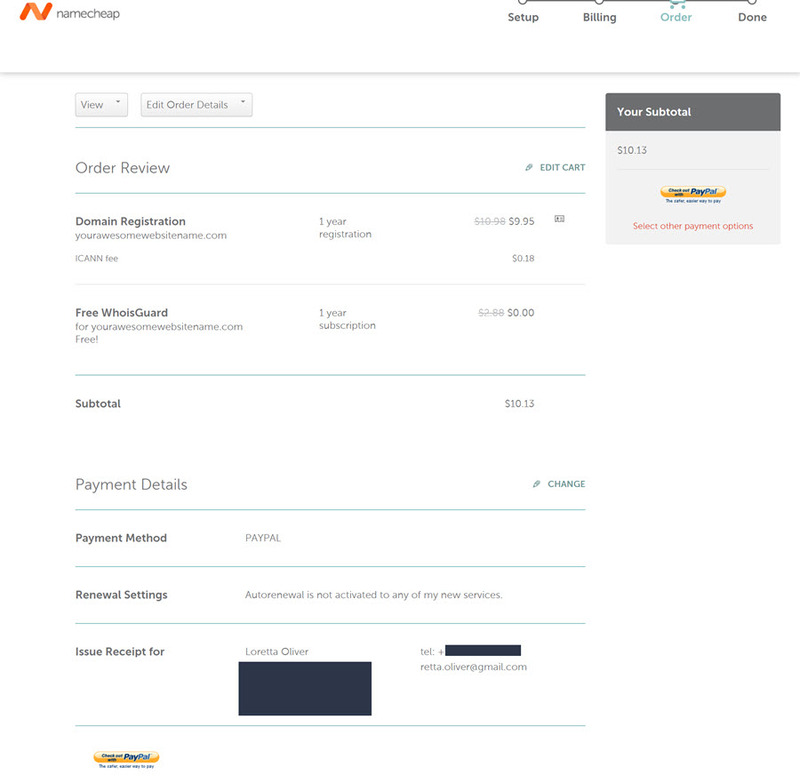 Namecheap offers free WhoIsGuard for the first year and I recommend checking that box so you don’t get all sorts of junk mail in your post office box, and it’s less than $3 per year to renew that layer of privacy protection along with your domain name. You spent some time thinking about what you wanted your URL to be, now it’s time to check and see if it’s actually available to register, which you can do right from Namecheap’s homepage. Just type it in the big box and click the search icon. It will take a moment to search and come back to tell if it’s available or not available. If it’s not available, it will give you suggestions of available domains or you can search again. 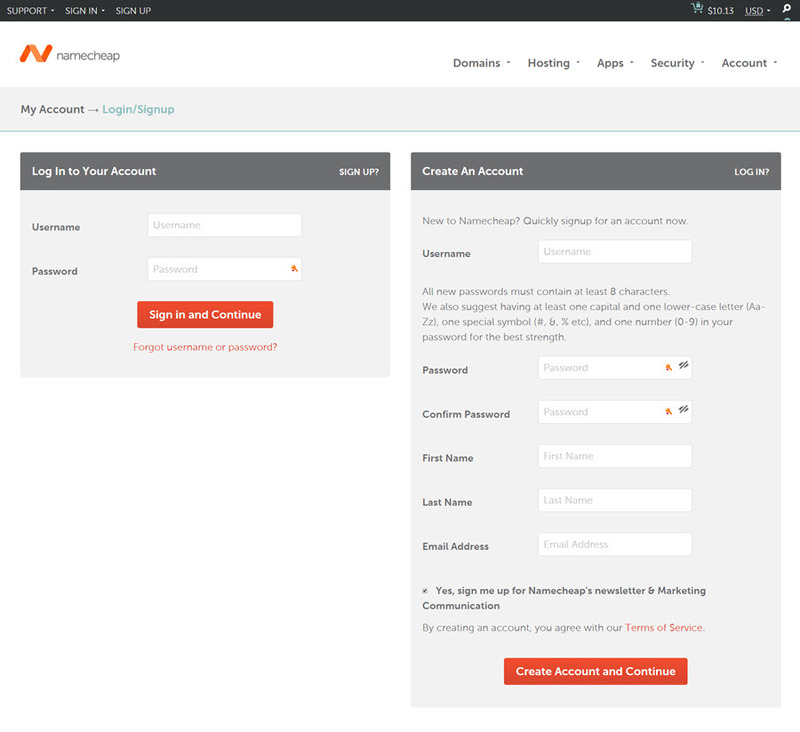 You can login if you already created your account before starting or you can create your Namecheap account here. They just ask for the usual details; create a password, your name, email address, etc… While it’s not asked for during the account creation, you will have to add a mailing address for the domain name contact details later. 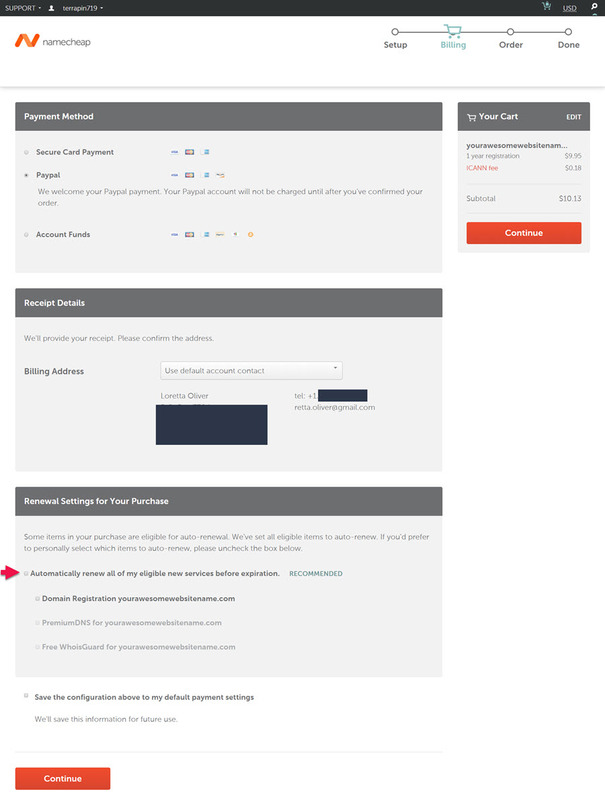 I have a Namecheap account already, so I’m going to login. Then it takes you to the payment page. Everything here is pretty standard for making a payment. You can choose from credit card or Paypal to make your payment. Important Note: At the bottom of this page, you’ll choose whether to autorenew the domain name or not. I uncheck the box and handle domain name renewals manually. You can handle that however you prefer. Whether you do this on autorenewal or manual renewal, they will email you before the domain name expires and let you know that it’s time for renewal. After the page is all filled out with your details, click Continue and it will ask you to review your order before anything is charged or completed. Give everything a quick scan, make sure the information is correct. Then click to complete the checkout. When you’re finished you’ll receive an order number and you’ll find a receipt in your inbox. Your brand new domain name will be in your account dashboard and ready to go. Congratulations on registering your brand new domain name! The next thing you’ll need is hosting to to store the files that make up a website so you can start building the pages and laying the foundation work for your new online presence. We’ll cover that in more detail in an upcoming tutorial. Your words are exactly right. Select domain name is more important. Domain name will be simple,unique and attractive.Your business related domains give more result because of customers search more,Our site will present top of the google when a client searching .Then possibility to choose our site is increasing.It will increase traffic.So when select a domain, It is very careful process.